Sources close to the information have informed us that 8-division world champion Manny Pacquiao was served with a lawsuit from his former accounting firm, VisionQwest Resources Group. "Manny was served personally," one source commented, informing us that Pacquiao himself was delivered the paperwork yesterday during a break in his training as he continues to prepare for his November 12 showdown with Juan Manuel Marquez. Evidently, both Pacquiao and his promotional company, MP Promotions, are named in the lawsuit, which was filed with the Los Angeles Superior Court. Back in August, Pacquiao terminated the services of VisionQwest Resources Group, the company he originally hired to review all of his business contracts dating back to 2005 to ensure that all of his accounting, both business and personal, were in order. It's a move that Michael Lodge, President & CEO of VisionQwest Resource Group, said was made due to "interference from individuals" and he promised that "our firm will deal with this issue in a legal manner under the contract laws afforded us as a business on the issue of interference in ones business." According to a press release distributed last month, Lodge revealed, "The main reason why VQ was hired to look into the missing money was because Manny believed that his fight promoter was not paying him his fair share." Evidently, up until VisionQwest was hired in 2010, Pacquiao's taxes were handled by several different accountants who "simply plugged in numbers supplied by Michael Koncz into the taxation forms and filed them with the IRS". As Pacquiao's popularity, and more impotantly his income, continued to grow, a red flag was raised that prompted the IRS to audit his taxes for the years 2006 and 2007. 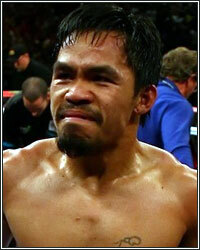 At that point, Team Pacquiao reached out to VisionQwest to help resolve their tax issues, and the company quickly realized that Manny Paquiao had no true knowledge of his financial worth, missing a number of key documents, including "bout contracts, bank statements, bout proceed distributions, endorsement contracts, promoter contracts, co-promoter contracts, and property ownership records" to name a few. At that point, the company began their investigation, agreeing not to request any fees upfront due to the fact that Pacquiao and Koncz informed them that there was a lack of funds and they would be unable to pay until they received either tax refunds or advances for future bouts. Moving forward, VisionQwest attempted to gather all the necessary documentation from Top Rank Promotions, however, what they were given was not enough to fully gain a complete understanding of revenue generated from Pacquiao's bouts. In a nutshell, Bob Arum and Top Rank became difficult to work with and "would not respond to requests for documentation and answers to questions". However, based on the limited documentation they were able to gather, VisionQwest's staff discovered "various accounting issues" and became concerned with the a number of questions that remained unanswered. They became even more concerned when they discovered "ridiculous amounts of money" being paid to Michael Koncz and, according to the press release, discovered that he was working on behalf of Top Rank, as well as Pacquiao. Shortly after these discoveries, representatives of Top Rank no longer responded to inquiries from VisionQwest, but the company was able to gather documentation from the Nevada State Athletic commission that verified the inconsistencies in reporting. Upon presenting these findings, Pacquiao evidently became upset and informed VisionQwest that he would take the issue up with Top Rank and Michael Koncz, however, he did not want to take any legal actions prior to receiving an advance from Top Rank Promotions for his November 12 bout with Juan Manuel Marquez. As such, VisionQwest put their investigation on hold, presenting Pacquiao with a bill for the services performed thus far. They also expected to be reimbursed for money that was borrowed from them in order to purchase Michael Koncz a home in Orange County. Instead of getting paid, however, the company was later fired by Pacquiao, and they have yet to receive any payments for any of the work that they did.